This is a copy of a Parker Jumper. 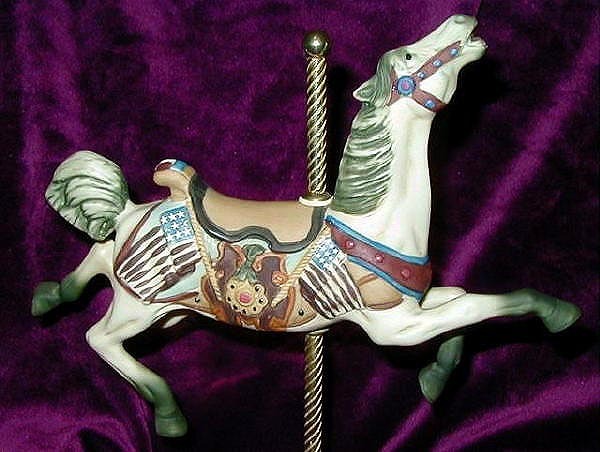 It is part of the "Carousel Memories Americana" Collection from Willitts. The run numbers on these are 9500 for the brass base, not sure what the others are/were. This piece came with several different base configurations. I have personally seen it with a rectangular music-box base, and the rectangular brass base (the "Group II"-type base). It may also have been offered on other common Willitts bases such as the brass oval and the oval music-box. The piece is about 6-7" to the top of the pole. There will be a coin set into the base of the "Carousel Memories Americana" series of horses to identify them as special editions. The average price of this piece when new was $40-$65.